Elizabeth was a descendant in the priestly line of Aaron. She and her husband, Zachariah, a Temple priest, lived an upright and blameless life in one of the hill-towns of Judea. The great disappointment in their lives was that although they had prayed fervently for a child, Elizabeth had reached an advanced age without ever having conceived. What a miracle it was, then, when the Archangel Gabriel appeared separately to Elizabeth and Zachary informing them that she would bear a son. This boy, to be called John, would be the forerunner of the messiah. Elizabeth was related to the Virgin Mary, and although we do not know their exact relationship, apocryphal writings suggest their mothers were sisters and consequently that they were first cousins. When Gabriel appeared to Mary to tell her she had been chosen to be mother of the messiah, he also told her that Elizabeth was expecting a child. He further stated that with God, nothing is impossible. Mary, eager to share in Elizabeth’s happiness and to relate her own good news, traveled from Galilee to visit her. Upon arriving, Mary greeted her kinswoman who was now six months pregnant. 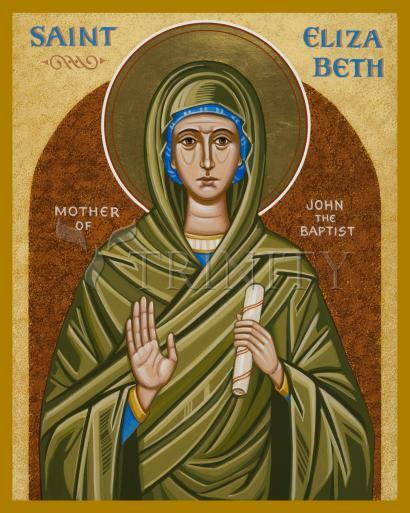 The moment she spoke, John leapt with joy in Elizabeth’s womb, thus acknowledging the presence of Christ. Elizabeth, filled with the Holy Ghost, responded to Mary with the words, "Blessed art thou among women and blessed is the fruit of thy womb. Her feast day is November 5. Celebration of Feast Day is November 5.